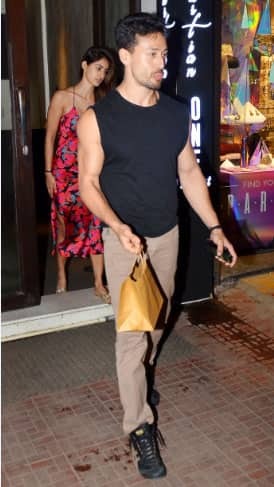 One of the most talked about couples in B-Town Tiger Shroff and Disha Patani were recently spotted outside a popular restaurant Bastian in Bandra, Mumbai. This place is a celeb regular who love to eat out and hang around in the area. The duo has been clicked together umpteen times yet they have maintained a stoic silence when asked about dating each other. Disha looked breezy in her spaghetti-strap floral midi and golden flats while Tiger kept it casual in sleeve-less black ganjis and tan pants. The duo which has just delivered one of the biggest hits of 2018 'Baaghi 2' have always remained tight-lipped about their alleged link-up. Disha was seen sans make-up and looked picture perfect while Tiger too kept it casual.